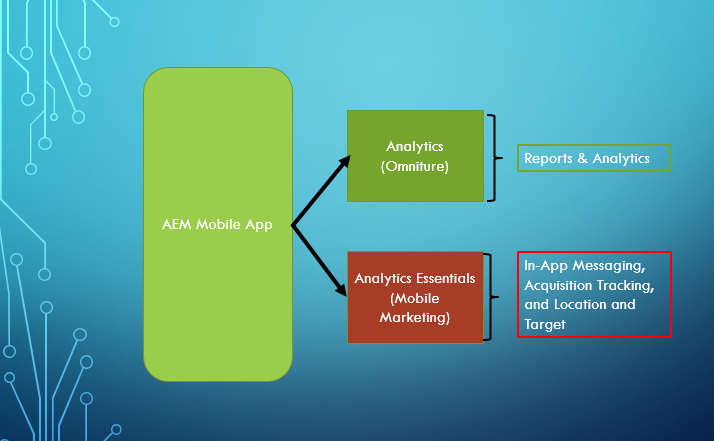 AEM Mobile analytics data can be configured to Adobe Analytics(SiteCatalyst/ Omniture) & Analytics Essentials(Mobile Marketing). SiteCatalyst provides report generation for all levels of Mobile content. Analytics Essentials provides some additional options like in App message,Acquisition tracking, Location and target etc. Analytics Essentials are part of Adobe Marketing Cloud. 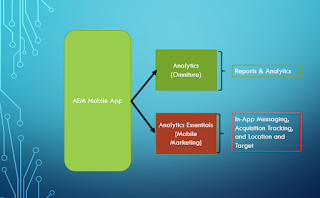 AEM Mobile apps are per-configured to report analytics information to Adobe data centers. all app related information like life cycle of the application are saved by default. Each project in AEM Mobile on demand portal will have a report suite, which is automatically created. Generally mobile app stores information like Path, Dashboards, Favorites, App and Mobile metrics and app-specific items (For e.g. Articles, Collections, Banners). How to customize AEM Mobile Menu? As of now the menu is not customizable. In case if customization is required, you need to contact your Adobe Analytics Administrator. Article Reports : All article reports like Article Impressions, Article Clicks, Article Views, Article Scroll, and Social Share. Collection Reports: All information like Collection and Article Impressions, Collection Open, and Article Click. Social Share Report: Number of social shares. Social Share Channel Breakdown Report: Device specific social share referral. Banner Metrics: Banner impressions, clicks. Overlay Reports: Hyper link clicks are tracked. Video Engagement Report: Reports like count, percentage of completion, duration , average time on video etc. Visitor Profile Reports: Visitor reports like unique visitors, overall visitors etc. Key Metrics Report: App level reports like installation, launches details etc. Can we get analytics report for Web Viewer? Yes . But Web Viewer only supports clicks reports not mobile related swipes or taps.